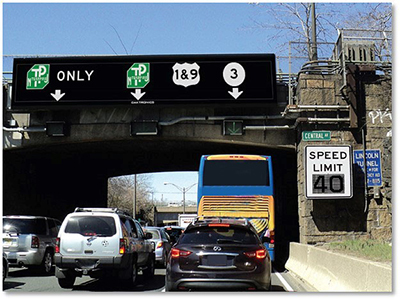 The New Jersey Department of Transportation (NJDOT) recognizes the significance of the Route 495 corridor and has developed a plan that will allow for the much-needed work to be done while minimizing the impacts on the traveling public. A carefully planned Traffic Management Plan (TMP) will be implemented to help minimize the impact of the construction project on the traveling public. The Department worked with County and Municipal governments, other government and non-government agencies to evaluate proposed mitigation strategies to help reduce congestion in the corridor and the surrounding road network during the project’s construction. Local traffic with destinations to the west, such as the NJ Turnpike, Route 3 westbound, or Route 1&9 will be impacted. An advance contract to install a series of Intelligent Traffic System (ITS) infrastructure including Full Color Matrix Dynamic Message Signs (DMS), Overhead Lane Control Signals and additional Closed-Circuit Television (CCTV) was completed during the summer 2017. This new equipment was installed prior to the start of construction to help motorists navigate the construction zone. The additional CCTV will help our Traffic Operation Team and first responders respond to incidents in a timely manner. To improve safety for motorists and for workers in the construction zone, the 31st Street on-ramp to westbound Route 495 will be detoured to Paterson Plank Road. To accommodate the additional traffic traveling along the Paterson Plank Road corridor, temporary intersection improvements will be implemented (minor widening, restriping) and the traffic signals on this route will be adjusted to allow more time for road users to get through. Similar improvements to Union Turnpike will also be put into place for motorists traveling west from Union City and points east. Other local detours will be put into place for motorists traveling westbound along Route 495 when the ramps for Route 1&9 are closed temporarily during certain periods of construction. For motorists traveling eastbound and destined to the Route 495 corridor, travel times will be posted using existing variable message signs or by dialing 511 or visit www.511NJ.org. Cameras will be used for traffic monitoring as well as to detect incidents and to notify emergency services as quickly as possible to help get you on your way. Tow trucks will also be on standby during construction to quickly clear the roadway when breakdowns occur. NJDOT is also advancing a robust public outreach plan to notify roadway users with up to date project information. The information will be disseminated through press releases. public information center meetings, community group meetings, radio and television announcements, a project telephone hotline (and this website), 511NJ.org website, Twitter, YouTube, mailings, outdoor advertising (billboards) and meetings with local major employers/employment centers through coordination with the Transportation Management Associations (TMAs).